This is actually a manga, not an anime, and it has been made into two live action movies (which are not nearly as good as the manga), and the manga is translated into English. If it's spoilers you want, go here for Death Note spoilers. What would you do if you found a notebook that gave you the power to kill whoever's name you wrote down in it? Would you throw it away? Would you use it to gain fame and fortune? Or would you use it to kill all the bad people in the world and usher in a new era of peace? How To Use It: The person whose name is written in this note shall die. How To Use It: The person will die after 6 minutes and 40 seconds. If the cause of death is not listed after 40 seconds, the victim will simply die of a heart attack. 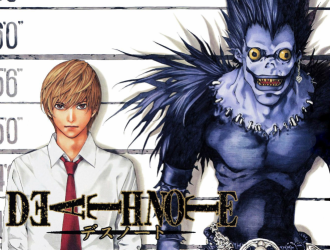 Ryuk is very interested, and Light reveals that his plan is to rid the world of all crime by killing all criminals. Ryuk asks why Light does not specify the cause of death - is it too much work? Light reasons that if criminals all die of heart attacks, people will not commit crimes anymore because they are scared to die. By using the Death Note, he says, he will bring forth a new world of peace, with himself as a god. How To Use It: The human who uses this note can neither go to Heaven nor to Hell. Meanwhile, Interpol is in turmoil as all of their suspects are all suddenly dying of heart attacks. No one knows what to do, or where to begin, but they suspect there is a person or force behind the killings, a person which Internet websites have begun to call "Kira" (like 'Killer' but in Japanese ;). We then see a mysterious barefooted character, alone in his apartment, seeing that he will inevitably have to save them. A masked figure, whom Interpol calls "Watari," brings in a (n Apple!) laptop with only a calligraphic "L" on the screen. This is Interpol's method for communicating with the mysterious barefooted detective genius, L.
How To Use It: If a human uses the note, a god of death usually appears in from of him/her within 39 days. L soon declares open war on Kira, and the game is afoot. L must track down a killer who seemingly kills people through magic or some other mysterious force by narrowing down the clues. Light must work to avoid leaving clues, while finding who L is in order to kill him, and figuring out the extent of his powers by testing the Death Note out on criminals. The manga leaves us small hints in the form of a "How To Use It" page on the back of most chapters, explaining further the more specific rules of the Death Note. How To Use It: You must have the face of the person in your mind when you write their name, that way, a person with the same name will not be killed. The result is an incredibly smart detective thriller as Light and L play a deadly game of chess (cliche count: 1) with the other forces that surround Kira. The manga is incredibly well written, and has some of the most amazing characters I've seen in a manga/anime in a long time. Light is probably one of the best anti-heroes ever to come out of Japan, and L is equally as good. Comic relief happens occasionally, but it's usually genuinely funny and usually to show that the writer is still having fun with the series instead of reaching for a cheap laugh. Occasionally the artist will draw Groening-style background jokes (like the aforementioned list of names). Speaking of the artist, the artist is the same person who drew Hikaru No Go, and finally his realistic style is used in a more proper medium. (I felt his level of skill was almost wasted on Hikaru No Go, which didn't need that kind of detail.) The manga is also very fast paced, and doesn't get bogged down in chronology, although it does tend to drag on when it shows characters discussing current events and how to decipher clues or what move to make next. How To Use It: Even the original owners of the DEATH NOTE, gods of death, do not know much about the note. What's really interesting is that very little is mentioned of the morality of Light's decision. Light mentions that you're taught in school that what he is doing is wrong, but the reality is that most people would, in their hearts, agree with what he is doing. Likewise, L is portrayed as simply on another side than the keeper of Justice. In fact, both L and Light consider themselves to be "Justice." Japanese fiction has always differed from Western fiction in that usually "bad guys" are show as simply being on another side, instead of being right or wrong. "Good guys" are usually shown as following their social duty than being right or wrong. Death Note is no different, as many characters don't quite know what to make of the situation, only that as detectives, or as such-and-such, it is their duty to catch Kira. Other characters who have strong feelings about it never really fully explain them. Only one character, Light's father, believes that what Kira is doing is wrong, and discusses it in the manga. 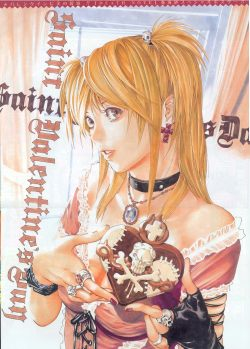 However, (spoiler)when another person gets a hold of the Death Note and uses it for personal gain, he/she is blamed and branded as a person who must be stopped, so it seems motive also plays a part in how people are viewed in the manga - people who have good intentions are seen as merely different, whereas people with bad intentions are actually seen as being "bad" or "wrong." This is in stark opposition to the western "The road to Hell is paved with good intentions." But no judgement seems to be made by the author, who seems to hold the same position as most of the other shinigami: aloof and indifferent. The author does, however, give us a view of a range of opinions, as well as show some insights into human nature. Did I mention that it's really good? Several key moments had me turning the pages too fast, and I had at least one night where I couldn't sleep because I was so excited about reading the next part. So, go read Death Note.